There’s something ironic about the timing of Bruce Springsteen’s Magic, an album that finds him working with his famed E-Street Band for the first time since 2002’s The Rising, and only the second time since Born to Run in 1984. Heralded as The Boss’ return to form as a bandleader and as a rock and roller, Magic comes on the heels of We Shall Overcome, Bruce’s largely overlooked collection of great American folk songs. As a tribute to Pete Seeger and a batch of dusty old folk songs written decades ago, that album should have been a relatively sleepy, academic affair; instead, it rolled and tumbled with more vim and vigor than any Springsteen album in decades. By contrast, his reunion with the E-Street Band was promised to be a lively, vibrant affair, but instead, it’s his most somber recording in recent memory, sepia-toned and stately to the point of making the The Rising and even the introspective Devils and Dust seem cheery by comparison. You’ve probably heard the first single, “Radio Nowhere,” which is both a good barometer and a red herring. There’s a sense of sadness and foreboding in the lyric that only grows more overt on the other tracks, but the music is punchier and livlier, rocking harder and faster, than anything else here. And though it’s familiar arena rock territory for the E-Streeters, its relatively high energy level makes it the closest thing here to a real curveball. Indeed, the song’s biggest fault is that, in terms of songwriting, it’s a bit lazy, a bit too easy for a talent like Springsteen, but unfortunately, the same holds true for just about everything here. These songs are surprising only for how calculated they seem, and most of them sound like pale immitations of much better, classic Springsteen songs; “Living in the Future,” for example, will never be remembered as anything more than a watered-down take on “Tenth Avenue Freeze-Out,” and the last three songs– all of them political in nature– sound like they are probably Devils and Dust outtakes. Of course, it’s not too surprising that the album sounds overcalculated and a little lifeless; it was assembed piece by piece, each instrument recorded separately, to accomodate the busy schedules of the band members, which means there’s no chemistry between the musicians, no rough edges or surprises of any kind. And for some crazy reason, Springsteen has reteamed with producer Brendan O’Brien, whose glossy production makes everything he touches feel far too much like the product of digital-age studio craft. What is disappointing, though, is how content Bruce seems to be resting on his laurels, hashing out pale replicas of his former glories rather than pushing forward into new territory. Everything here feels deliberate rather than inspired, and the melancholy flavor of the songs only highlights how lackluster the craft really is. 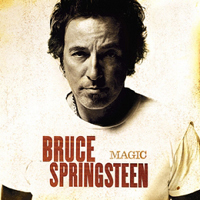 The album is called Magic, but alas, Bruce and his band are sadly content with their same old tricks.